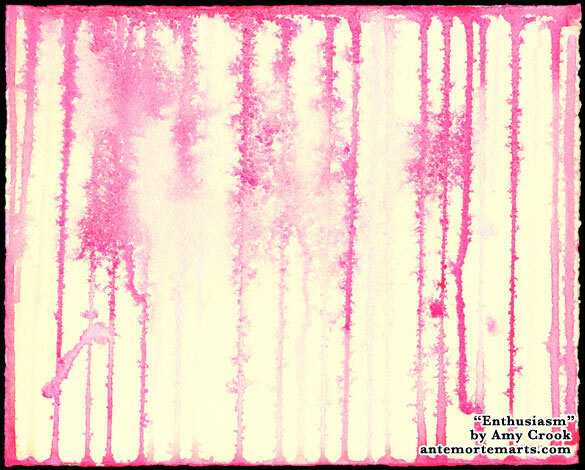 One of my dear friends loves hot pink, so I borrowed some of her enthusiasm for this Pathways painting. 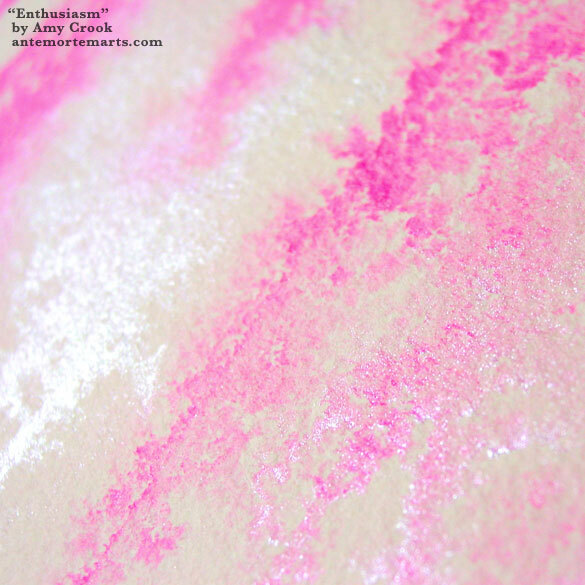 The result is actually quite gorgeous, buff paper offsetting the pearlescent white intermingled with the rich, glowing pinks. The whole thing has a bubbly, warm feeling to it would brighten up any space, and be especially beautiful in the sunlight. 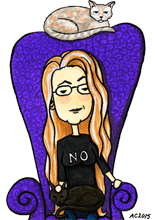 Where in your life do you need a little Enthusiasm? Above, you can see the sparkling white catching the light next to the gorgeously detailed pinks, spreading out like water on a window creating pattern out of the interaction between two spaces. Below, the piece is in a frame, its shine muted by the angle of the light. 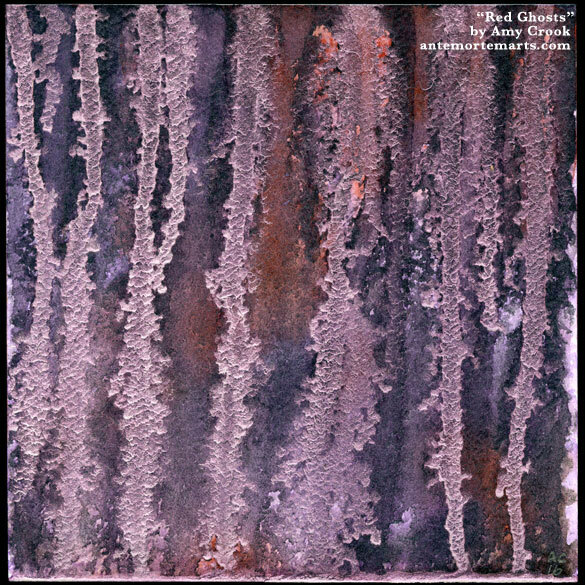 This lovely, subtle Pathways painting is a reminder that even while the world burns, there’s still beauty in it. 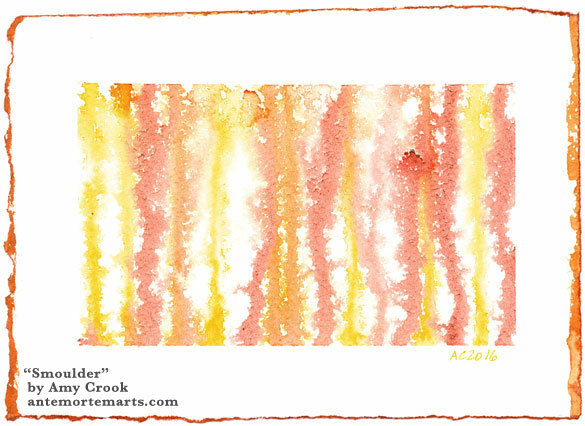 The fiery colors are a mix of natural and artificial pigments, a limited palette with some soft sparkle and a lot of warmth that’s still muted enough to be sophisticated contemporary art. 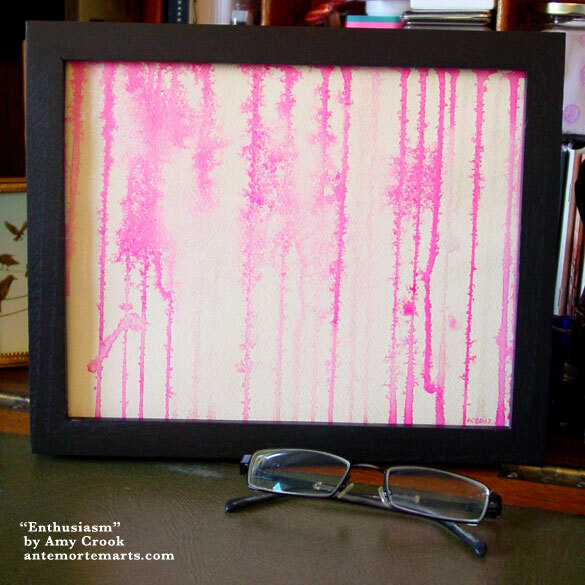 This abstract painting would look stunning in your home or office. 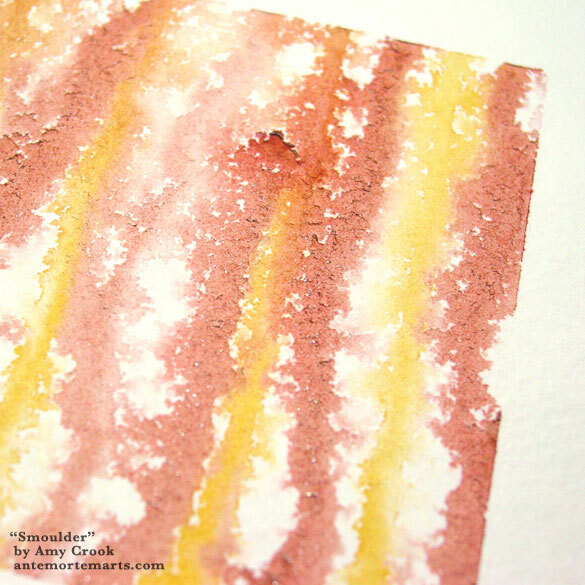 The muted warmth of this piece is hard to capture, but the detail above shows it pretty well, along with the texture of watercolor and paper and even the tiny hints of sparkle hiding in the paint. Below, you can see it in a temporary frame, floated on a white background to show off the hand-torn, hand-painted edges. 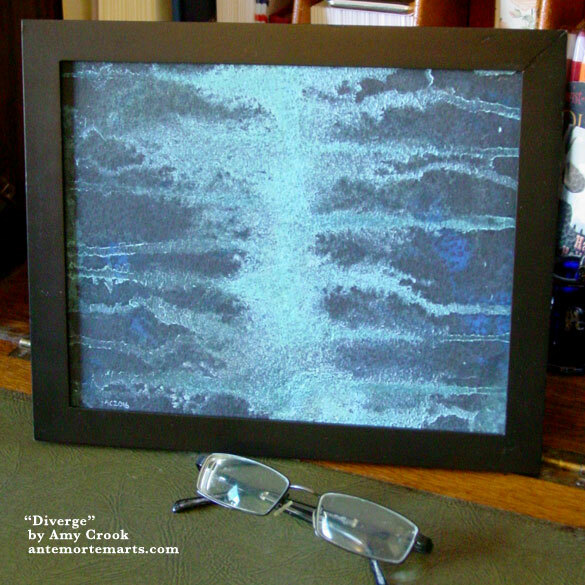 The watery, shimmery blue Pathways are diverging in this layered abstract painting. 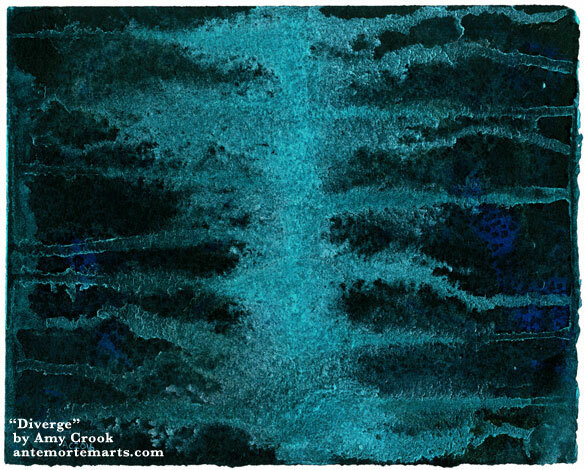 A subtle, mottled pattern of dark blues and black voids hides behind the turquoise waterfalls spilling to either side of the central path. The texture of the top layer is softened by the paint beneath it, but the sparkle shines through in the right light. These pathways diverge, but for once you can have it both ways. 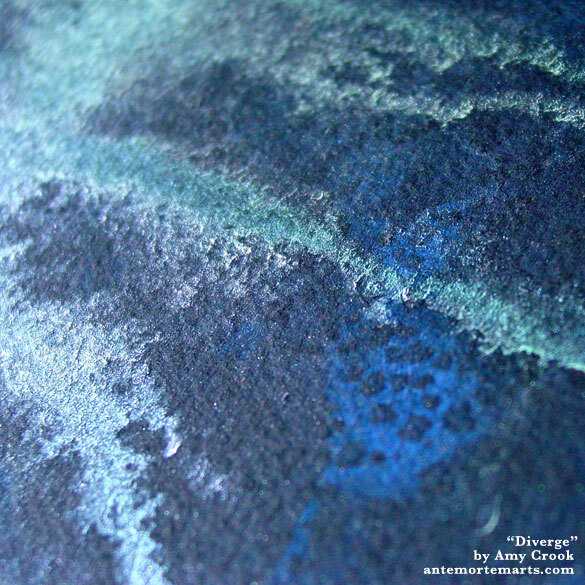 Above, you can see one set of divergent pathways running over the soft, textured background in dark blue and darker black. Below, the pathways are contained in a frame, reminding us to look both ways. This newest Pathways painting is quite a small example of its kind. An off-kilter view suggest the viewer is laying down, looking out at some sort of mountain landscape through vine-laden bars on a square window. 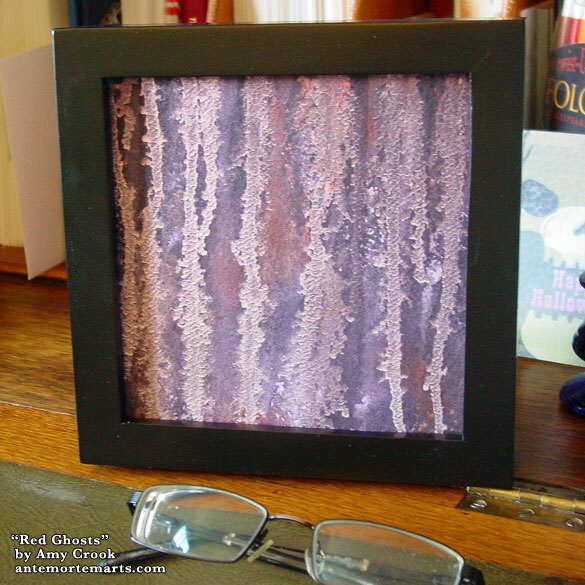 There’s a tiny bit of sparkle in this one, but mostly it’s just lovely violets on the warm buff-colored paper. 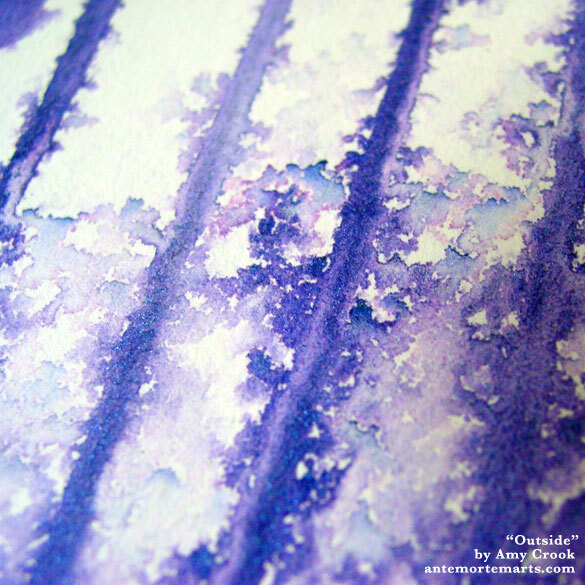 This piece would display beautifully in a frame with a white mat to set off the delicate warmth of the paper, or even floated on a dark, pearly grey to display the hand-torn edge of the paper. 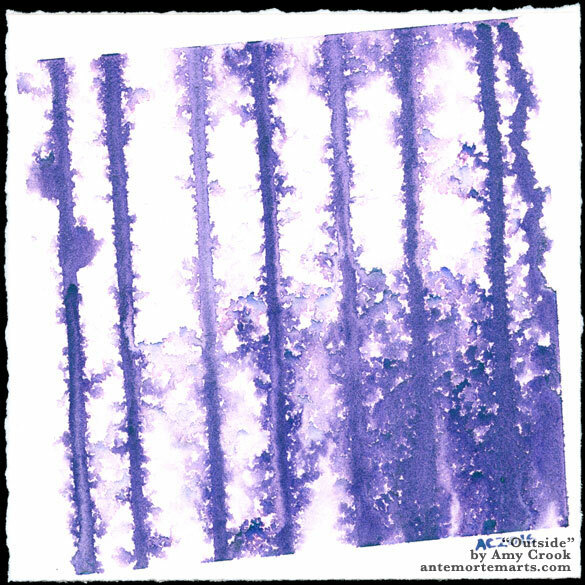 Above, you can see the subtle variations in the violet much better, and just a hint of shimmery sparkle hiding in the deepest purples. 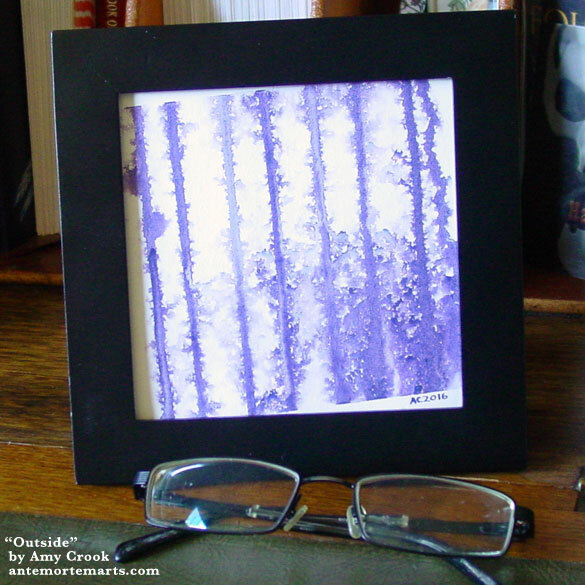 Below, you can see this small painting in a small frame, perfect for adding color to a small space. Happy 4th of July! Looking at this today, I wonder if I shouldn’t have named it after fireworks instead. The mysterious red-violet depths of the background in this beautiful abstract make the perfect grounding for the ghostly shapes that float atop them. The interference red switches from white to shining red depending on the angle of the light, throwing off little ghosts of color and letting the looming shapes behind show through. This is one of those paintings that will catch your eye at odd moments and show you a new detail every time you look at it. Perfect for adding a touch of beauty to your space. 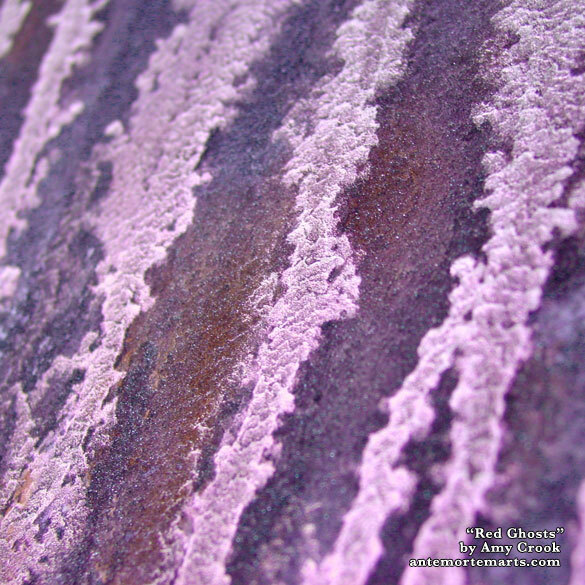 Above, you can see the beautiful interference red catching the light, as well as the gentle sparkle of genuine amethyst and garnet paint in the complex background layers. Below, the ghosts have gone white with their faces turned away from the sun in this simple frame. 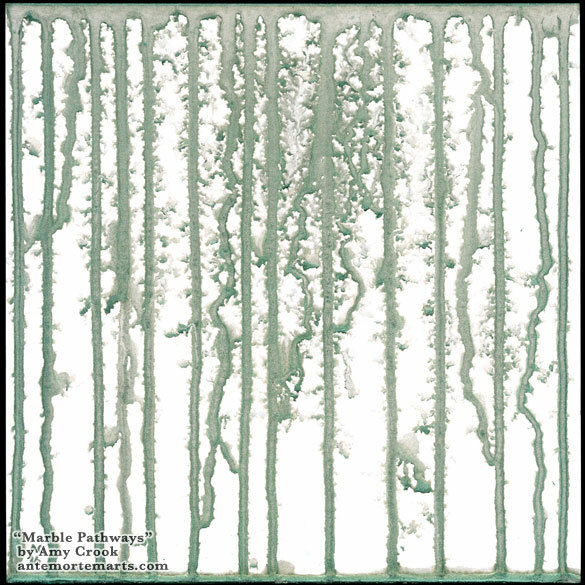 This painting reminds me of the very first Pathways painting, with its sparse lines framing the white page. The beautiful black tourmaline mineral pigment provides a pearly grey base for the sparkling paint atop it, like veins of malachite in creamy white marble. 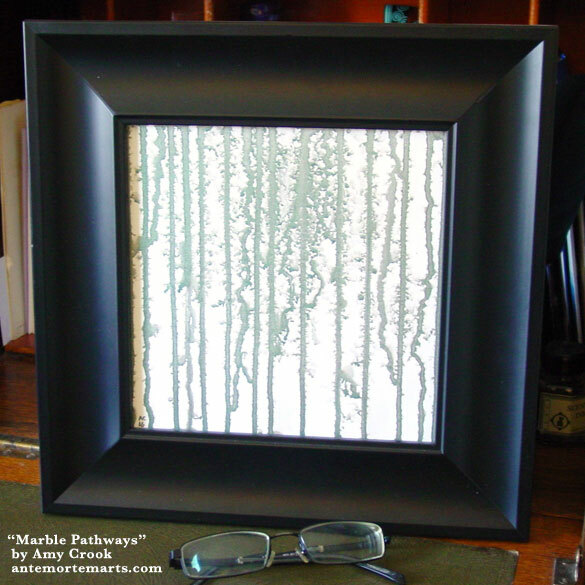 A piece that rewards repeated viewings, this abstract contains layered detail in the subtle interactions of paint, paper, and light. 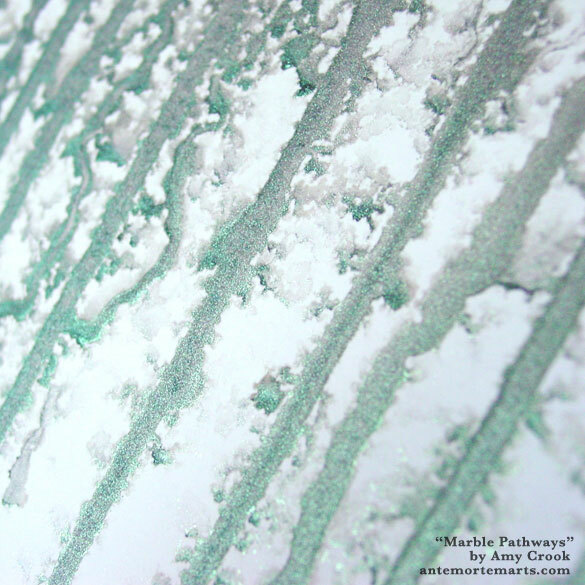 Above, you can see the green sparkle and hints of pearly grey beneath it as the pathways shine in the sunlight. 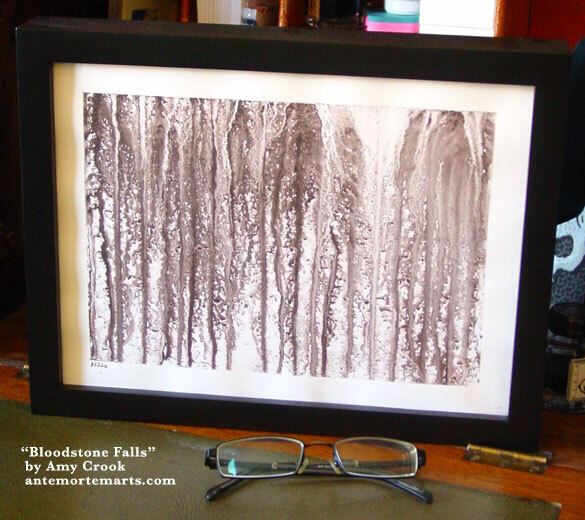 Below, a black frame gives just the right accent to this beautiful abstract art. 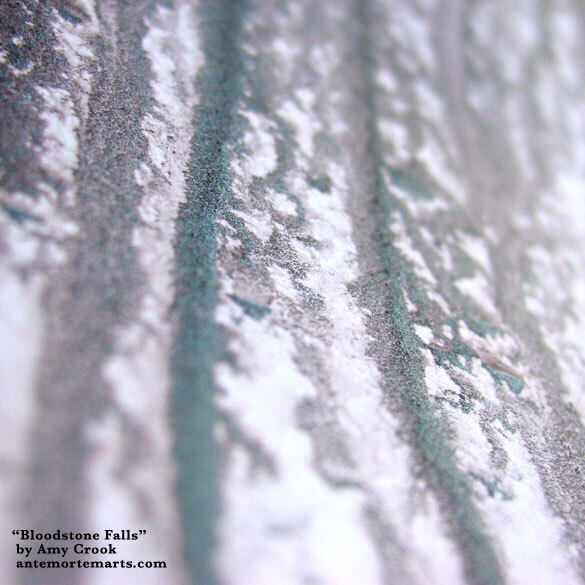 Beautiful bloodstone mineral pigment is mixed in with iridescent scarab red to create an earthy blend with a secret shimmer. The green sparkle shows up in strong light, like emeralds caught in the flow of river silt. 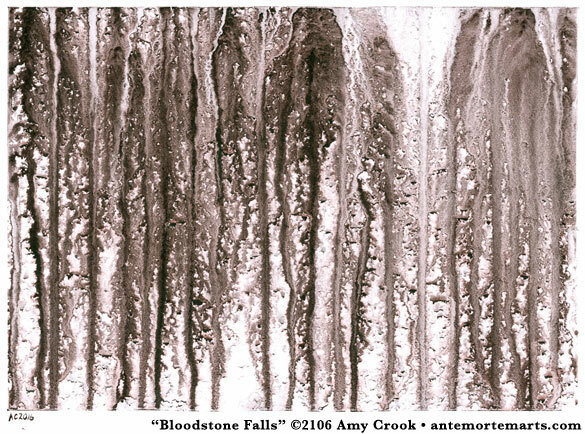 Even though the Bristol is a very smooth surface, the bloodstone still granulated gorgeously, adding a subtle texture to the image. This Pathways painting would be perfect for an earth witch, with its half-seen shapes and magical secrets hiding in the abstract neutral tones. Above, you can see the iridescent green pigment catching the light, surrounded by the reddish brown of the bloodstone mineral. 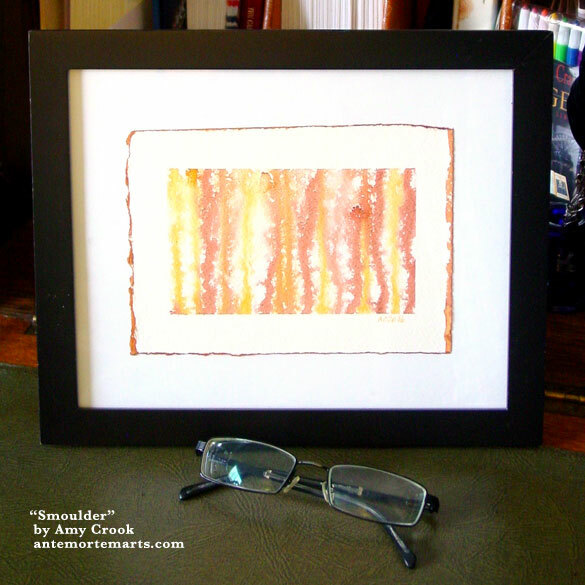 Below, the piece is in a frame, all ready to find its place on a wall, desk, or in a secret niche.